Is the floor going to be new concrete or existing? How flat is the floor that is going to be polished? How many cracks are in the floor that is going to be polished? Are you “ok” with irregular aggregate exposure? What level of aggregate do you want to be exposed? Are there any trenches or patches in the floor? Is polishing really your best choice? What “look” are you trying to achieve? Are we going to be adding any color or materials to the “wet” concrete? Is there UV exposure to any of the floors? What kind of spills do you anticipate (kitchen vs. hallways)? What kind of coloration are you hoping for? What other trades will be in the area during construction? What hours will polishing take place? What kind of access do we have – are we able to get very large equipment to the area? Polished concrete is beautiful, low maintenance, durable, and authentic. At Colorado Hardscapes, we have one rule with any of our finishes due to the versatility … samples…samples…samples! (and mock-ups…which is just a larger, on-site sample). 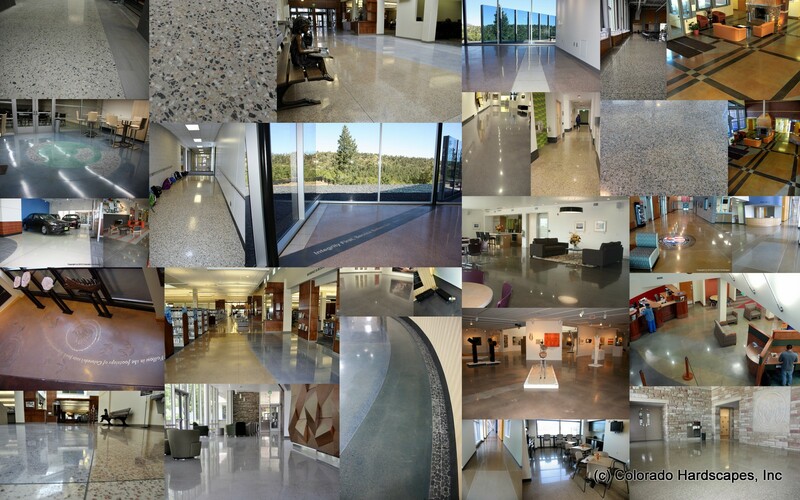 Stay tuned for our new “polished concrete” page on our website!